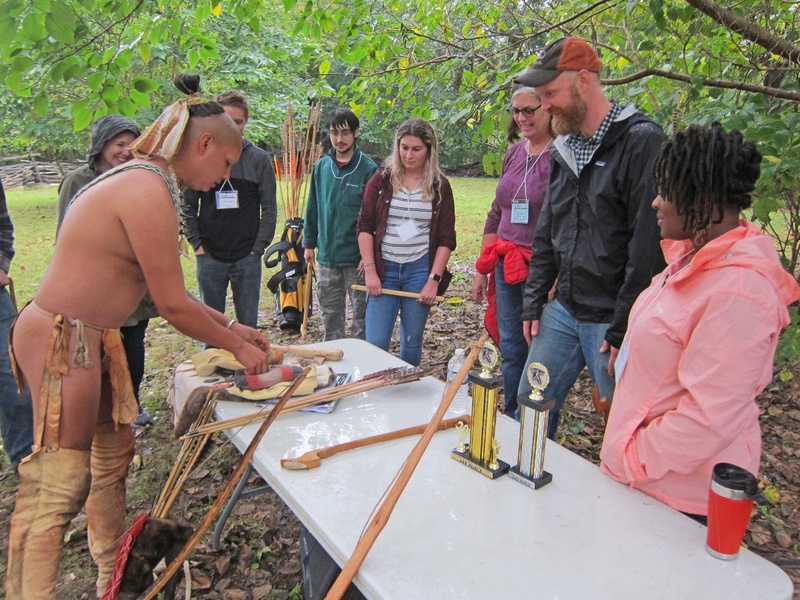 The 8th annual Reconstructive and Experimental Archaeology Conference, hosted by the experimental archaeology group EXARC (https://exarc.net), drew speakers and participants from many parts of the world. 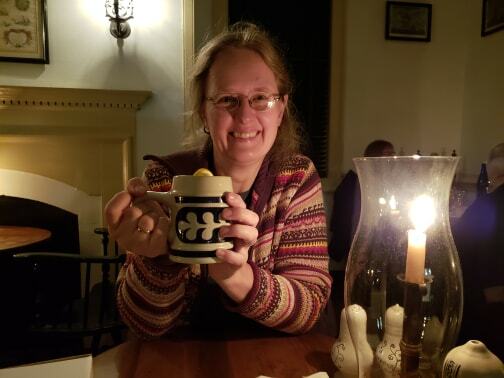 The REARC conference once again took place in Colonial Williamsburg in Virginia from October 18 to 20. Mistress Chrestienne deWaterdene and I drove down together to check out the event. 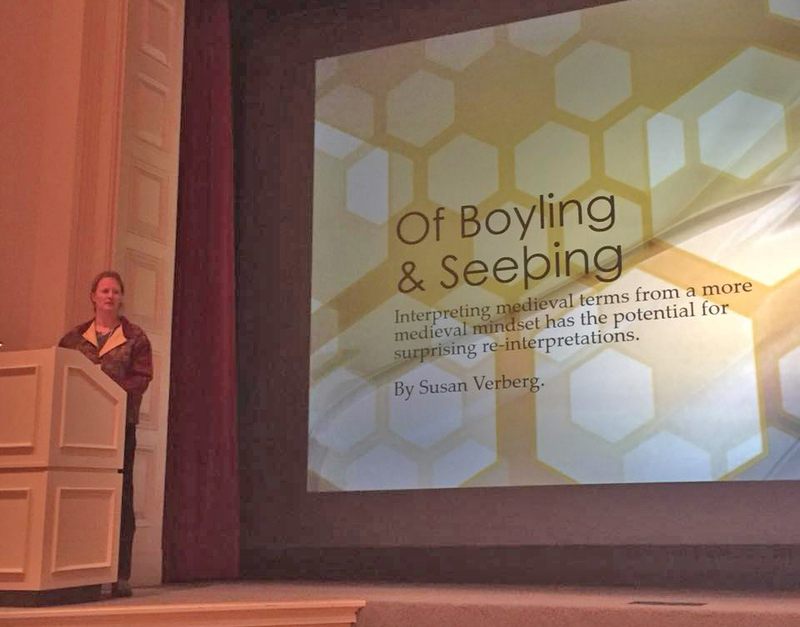 Friday was reserved for the presentation of papers by students and researchers alike, demonstrating the wealth of information and practical skills available within the EXARC community. Saturday was filled with numerous demonstrations in which the conference attendees could participate and museum visitors could watch and learn. The presentations ranged from practical recreations like making flutes from bird bones and weaving with captive reed beads to duplicate pottery impressions to the use of recreated objects such as determining if Ötzis’ tools were for hunting or for warfare, and the function of experimental archaeology within different types of classrooms. Some researchers presented a follow-up on previous papers, such as Neil Peterson with his ongoing Viking bead furnace project. Some might look for resources not yet found; the joy of Caitlin Gaffney after finding a possible source for a reproduction medieval knife to carve her bone flutes was absolutely contagious. And some were looking to network: David Spence asked for additional projects for his experimental archaeology in high school plan and left with numerous contacts and suggestions. 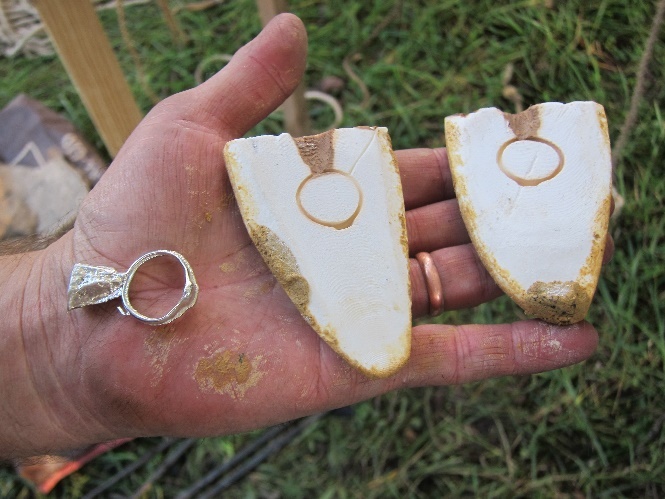 Each and every paper had some unique view, some unusual bit of information; since the practical aspects of experimental archaeology requires a more interdisciplinary approach than traditional academics, conferences like REARC are essential. You just never know from what discipline, from which subject, the answer to the question you did not even realize you had could come from. I personally was amazed to find that the gist of my paper — to not take words at their literal modern definition — was independently repeated in another paper… to have my initial interpretation validated via an independent source right then and there. The work stations, surrounded by assorted Colonial-era garments being altered or repaired. 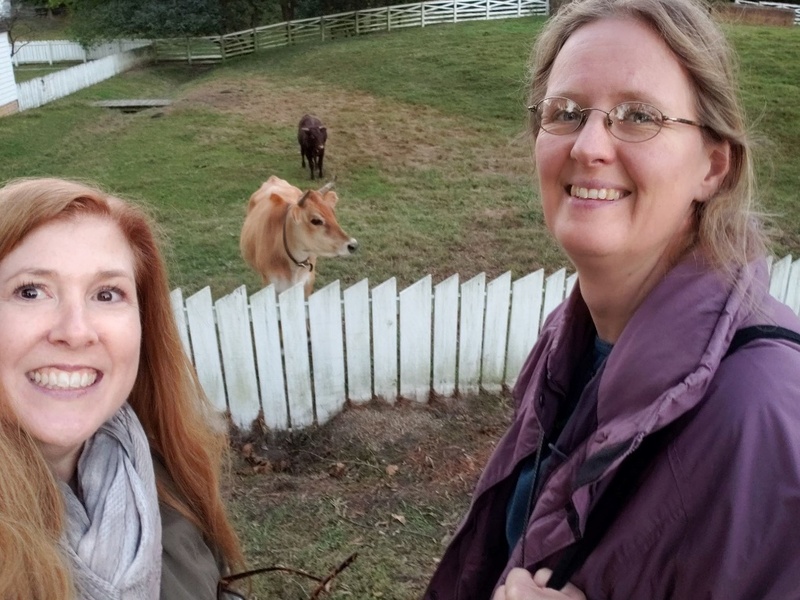 During the lunch break, Chrestienne and I quietly excused ourselves and took a quick look at the Annual Open House at the nearby Colonial Williamsburg Costume Design Center. 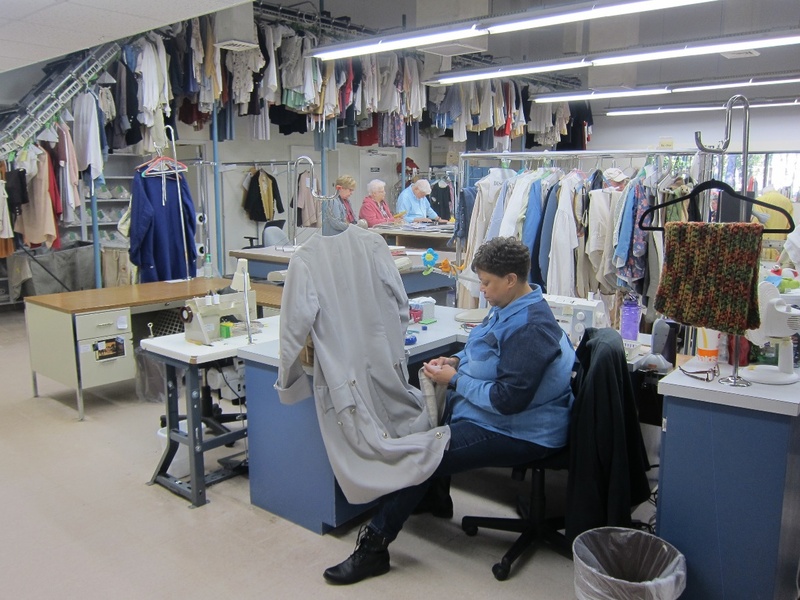 Here, the staff fits, designs, creates, and dresses the area’s costumed interpreters. Talon Silverhorn showing his beaded belt made using Fingerweaving. He also told about how his tribe uses this technique to record and tell stories right up to our modern period. 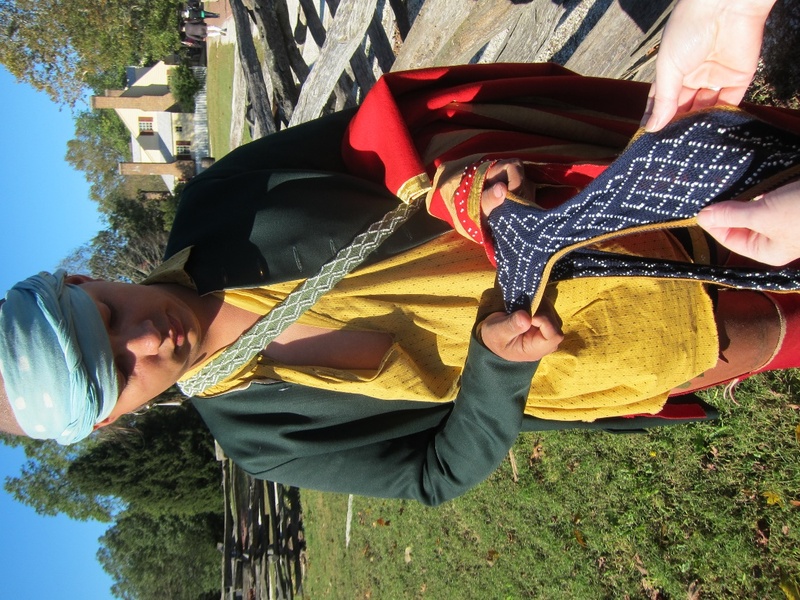 I also learned that the colonial interpreters do not make nor own their costumes. It is this department that researches, designs, fits, and creates for everyone on the payroll. Except for the Native Americans, it seems. We did not see any Native American wardrobes out in storage or on display, and from talking with Native interpreter Talon Silverhorn we learned that most make their own as part of their tribal community and heritage. Bill Schindler, experimental archaeologist and co-host of the National Geographic show The Great Human Race. I enjoyed our conversation over a craft beer at the hotel, and even taught him a thing or two about historic mead brewing. The keynote speaker for this year was Bill Schindler, an experimental archaeologist with Washington College and part of the Eastern Shore Food Labs. 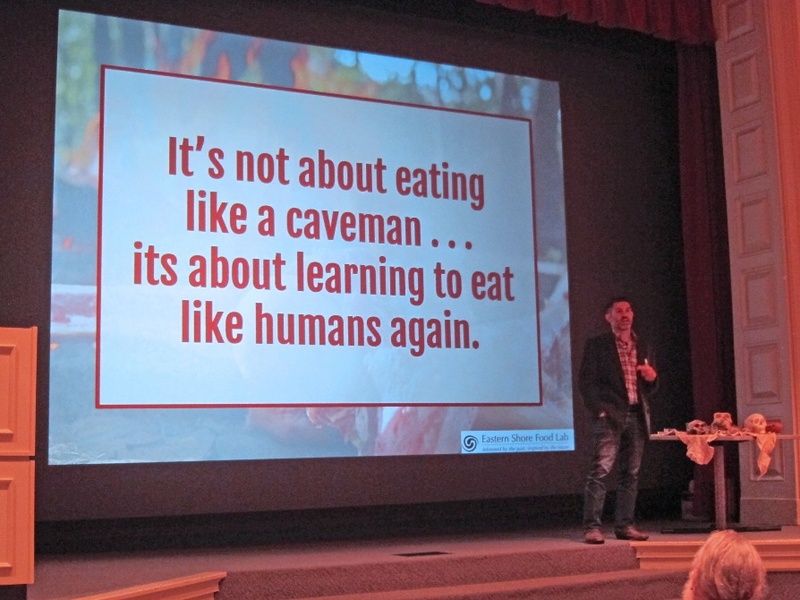 His quite-engaging presentation on Fusion: ancestral diets, modern culinary techniques, and experimental archaeology was well received and left the audience with a number of questions to think about. 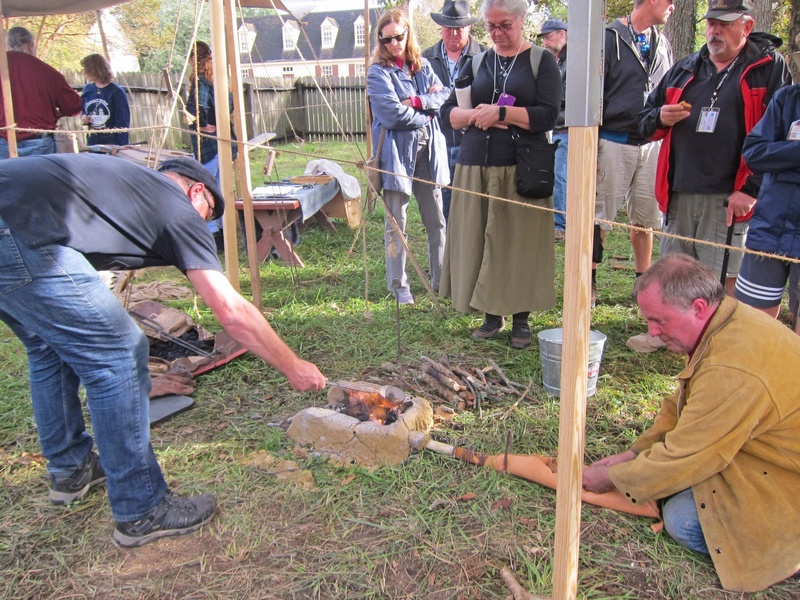 This paper was perfect for the younger generations now growing up in an environment that might be more hostile to them than they would surmise, and this area of research, experimental archaeology, could help shed light on where to go from here. The connection between human biology and our diet, and the impact industrialization has had on our health to the point where humans and our pets can be both obese and malnourished, is not only fascinating from an academic point of view but relevant to the survival of our species. 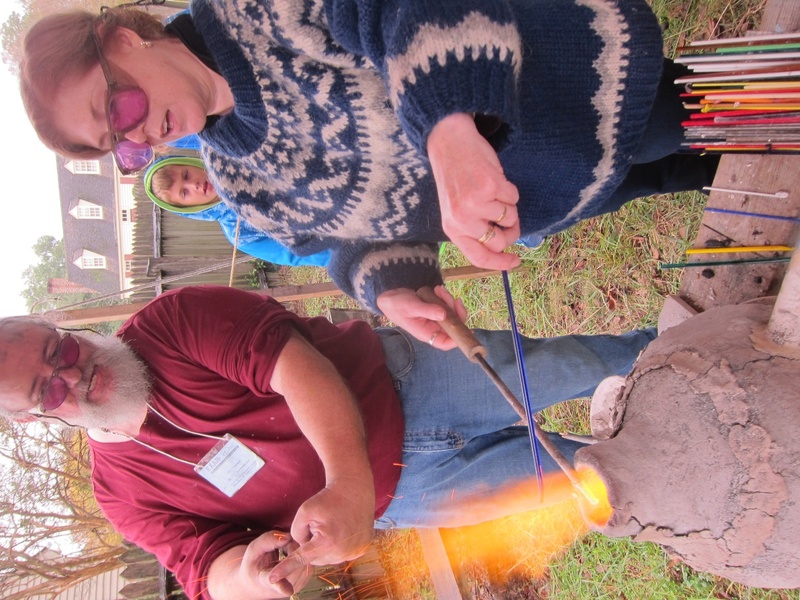 This year’s demonstrations were two part: the practice of throwing atlatl and observing and shooting early bows, combined with the technique of smelting and casting bronze and making Viking era glass beads. Unfortunately, while the weather was absolutely gorgeous on Friday, by the time Saturday came around it had changed to intermittent drizzle and rain. But that did not stop us from having a go at each of the stations and appreciate the added value of tent coverings at the metallurgy and flamework areas. While I would have loved to try the Ötzi replica bow as initially intended, Manuel Lizarralde did not feel comfortable to have it out in soaking rain as it was not yet waterproof. I did get to shoot a fire-hardened black locust Native American self bow, weatherproofed with bear grease, and even hit the target center. Conference host Tim Messner enjoyed the primitive tattoo kit and extant stone tools that Talon Silverhorn, Native American interpreter, brought to share – and almost talked him into a tattoo demo on the spot! Fergus Milton, with help from David Spence, melting bronze to do a lost-wax mold casting later in the afternoon. 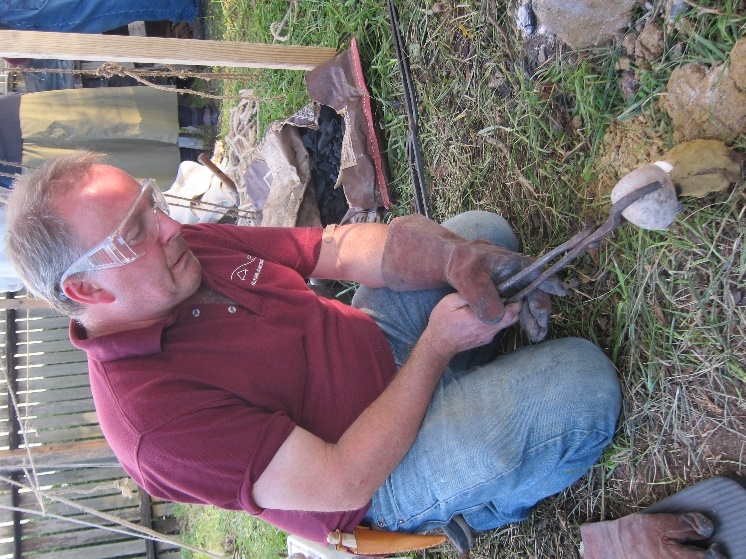 At the station near the blacksmith area, we enjoyed Fergus Milton’s bronze casting demonstrations — with help on the bellows by David Spence — using a small furnace constructed on site from local clay and aerated with a primitive leather-bag bellows. He began the day by smelting the bronze and preparing two molds, and poured the molds mid-afternoon. Several museum guests returned specifically to witness the casting, after stopping by periodically to keep an eye on the proceedings. Chrestienne making her first Viking glass bead over a charcoal bead furnace under the expert supervision of Neil Peterson (a SCAdian of old). She’s wearing the loaner sweater Neil provided (available to those wearing flammable man-made fiber fabrics). Wool is a safer fabric to protect against sparks and burning embers. At the same time Neil Peterson had his coal-fed bead furnace up and running for conference attendees to try their hand at making a Viking glass bead. His station was in continuous use throughout the day and many of the attendees left with a precious homemade bead in their pocket. Surprisingly, participants often had more trouble with the coordination required to operate the bellows effectively, me included, than they had creating a simple bead. Pouring molten tin into a cuttlefish mold encased in fresh clay as support. The mold is only able to be used once, becoming burned during use. Although tin is used to demonstrate, it is a softer metal than the master used for the impression. Finally, before packing up, Fergus Milton did a quick demonstration of cuttlefish casting for David Spence to consider showing to his high school students. He used some tin he had on hand, and as it had a lower melting temperature than the bronze, it quickly became molten and he was able to show how the porous nature of the cuttlefish bone lends itself well to making a quick mold. It takes in a good amount of detail from the master used to press into the material and feels a bit like a dense, fine Styrofoam when pushing a metal object in to make an impression. 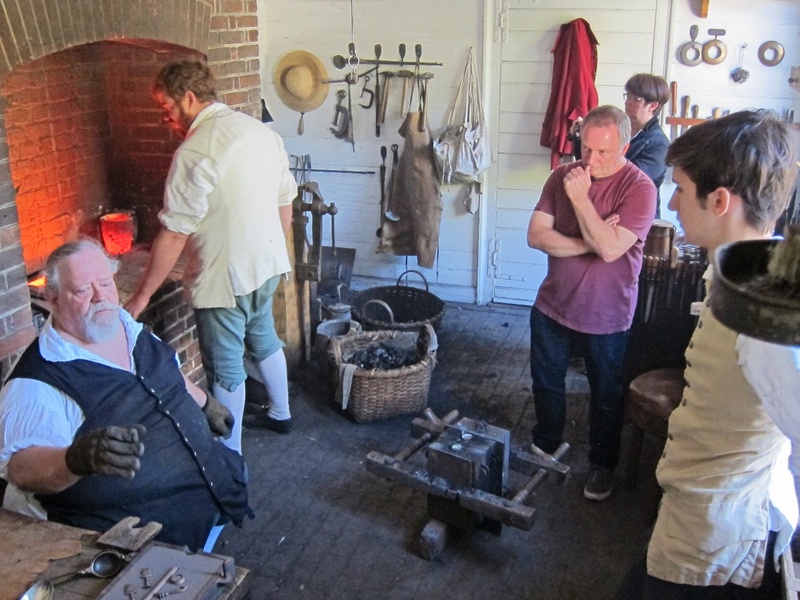 To cap off this wonderful experience, the resident founders at Williamsburg had invited Fergus Milton (burgundy shirt) for a special bronze casting demonstration at their shop on Sunday morning. To experience the prehistoric process, so closely followed by the much more refined methods of the 18th century Geddy Foundry, was an appropriate ending to an otherwise perfect immersive weekend of reconstructive and experimental archaeology. We are ready to come back for more next year! All photos credited to S. Verberg, unless otherwise stated. For details on the presented papers, see the EXARC site.